Yes, really! The world is just a better place eating chocolate chip cookies, especially because they are grain and sugar free!!! Yay!! 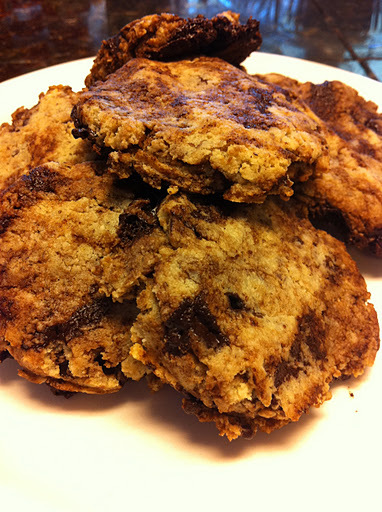 The Homemade Chocolate Chunks were a success and here is my first recipe using them. These cookies are more than I was hoping for. They are soft, with a little crunch around the edge. They are not too cakey with a little bit of crumble (but not too much). 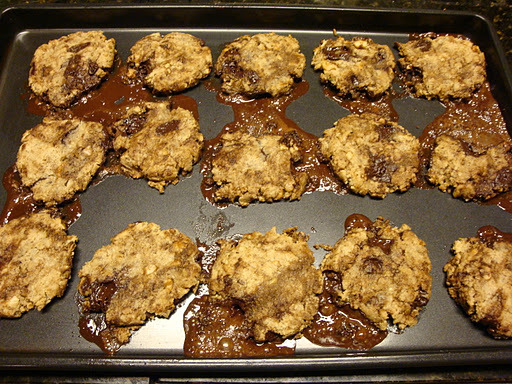 Since the chocolate chunks are made with coconut oil, the chips will begin to melt, even as you blend them in the dough. If you keep them in the freezer, they will melt less. Don’t worry.Just work fast!!! Even when you take them out of oven, some of the chocolate chunks from the bottom of the cookie will melt out, but there is still plenty of chocolate in the cookie! Here is another recipe where a tablespoon scoop is just so handy. Also when flattening out the cookie, I put my hand inside of a sandwich bag and press them flat. I use sandwich bags for so many things! Add egg, melted butter and vanilla. Mix well and taste for sweetness. 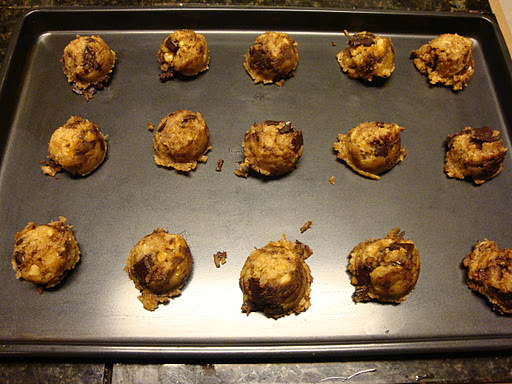 Remove chocolate chunks from freezer and mix into dough. 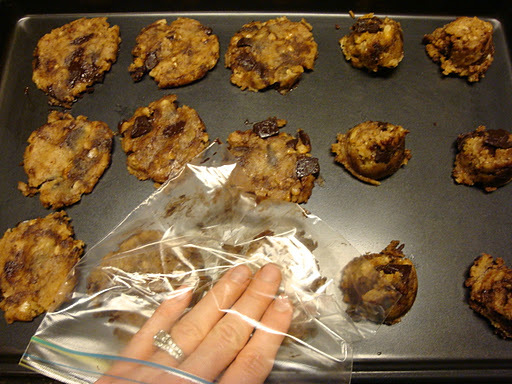 Scoop out using tablespoon or small scooper (so easy) onto ungreased cookie sheet. 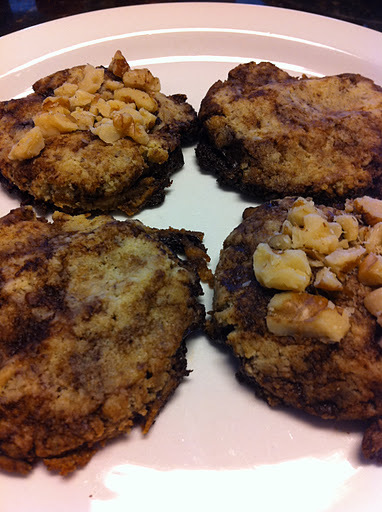 Optional: Sprinkle walnuts on top of each cookie. If you mix them into batter, the cookies will be drier. Remove and cool on pan. 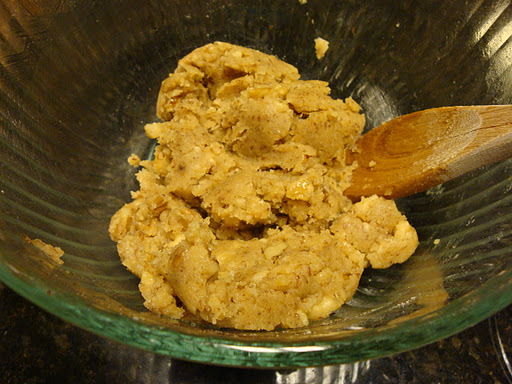 Dough before adding chocolate chunks. Use small scoop to make perfectly sized cookies. Use sandwich bag to flatten cookies before going into oven. Cookies right out of oven. Don’t worry about chocolate spillage, there is still plenty of chocolate in the cookies. I am eating these right now with your 5-minute ice cream–delish!! Do you use the regular flaxseed meal (brown) or the golden flaxseed meal? I'm going to try the golden next time. What a great combination! I use regular flax seeds but you could definitely use golden! Just baked a batch of these and they turned out perfectly ! All I have is Stevia In the Raw, so after tasting for sweetness, I mixed just a little honey in the batter. That did not make them too sweet at all 🙂 The cookies held together beautifully during baking and came out moist and just a little crisp around the edges…nice golden color too !